Domestic smartwatch maker Yingqu impressed the public today by rolling out six products under its homegrown brand inWatch, including inWatch One C, inWatch Z, inWatch X, inWatch Junior, together with, inWatch Kid and inWatch Health Care, two custom gadgets for kids and senior citizens respectively. inWatch One C is offered in three colors of black, white and gold. Featuring a 1.54-inch touch screen and powered by Android 4.1 system, it supports WiFi, bluetooth and GPS connectivity. As an upgraded version of inWatch One, inWatch One C removes the metal strip on top of the touch screen of inWatch One and adjusted the position of camera, avoiding the inWatch One’s problem of blocking the camera. Moreover, the battery life of inWatch One C is increased to 120 hours from 48 hours for inWatch One. The product is priced at 1,399 yuan ($233) and will be put into mass product in January. inWatch Z is made of metal materials with friction-resistant sapphire screen and ceramic rear cover, which accelerate the dissipation of heats. It adopts 1.2GHz dual-core processor A7C with 5 million pixel camera and 580mAh battery. The new inWatch Z is also equipped with a GSM SIM, WiFi, and bluetooth for access to mobile data connectivity. The product is priced at 1,799 yuan ($299) and will hit market in January. 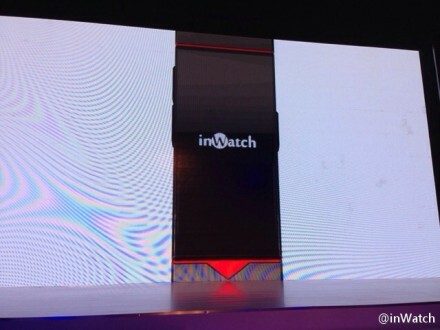 inWatch X is developed by an U.S. laboratory under the company, an incubation project dedicated to western markets. The product features a 0.1 mm thick flexible display developed by Samsung and LG and is powered by 4.3 Android system, 512MB RAM and 4G ROM. The product is priced at 2,499 yuan ($416) and will be shipped in April. inWatch Junior is smart wristband for juniors, which is priced at 499 yuan ($83). inWatch Kid is a kid tracking device with GPS. Other functions of the gadget are voice dialing and voice recognition. inWatch Health Care, a health care product for the elderlies, adopts the brainwave sensor developed by Neurosky. inWatch currently has a team composed of more than 60 members, scattering in Beijing, Shenzhen and New York, according to Neo Wang, CEO and founder of the company. The competition in smart wearables industry is heating up in China. With different positioning, every product released this time is dedicated to a specific group of users and has their own advantages, said Wang.